'Beauregard', the Louis A. Thebaud estate designed by Roos & Booraem c. 1904 in Morristown, New Jersey. Thebaud, an importer/exporter, was also a sportsman and philanthropist. He was responsible for introducing wire-haired pointing griffons and Brittany spaniels in the country and funded the building of the maternity ward to All Souls Hospital where he was also a director. During WWI he provided space to a local group known as the "Trench" which made surgical dressings and other medical supplies needed in the war effort. The house is now part of a Care One facility, click HERE to see 'Beauregard' on google earth and HERE on bing. The article from the Architectural Record calls this a large suburban house approached from the street. But "The Mansions of Morris County" calls it "Beauregard" and says it was on a 300-acre tract on Madison Avenue. It also says Thebaud had the existing owner's "mansion" torn down before he built his own house. There's also a good picture of the dining room you might want to snag for this post. Thanks...I've also since found the house (and added links). I had been looking in entirely the wrong location. 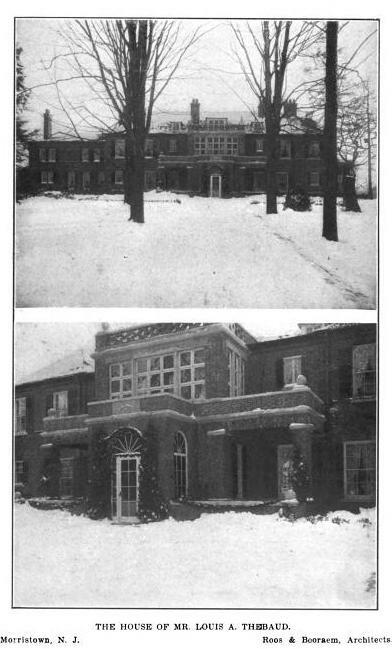 It appears that the designer's conceit was to make it appear that it was a typical small tudor or jacobean manor remodeled in the early Georgian era. 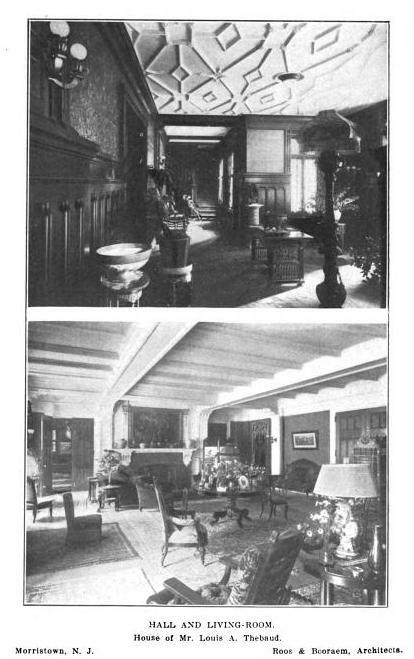 additionally the pages that follow todays post are full of pictures and some info about the mansions that at one time lined madison ave from the town of madison ( sports teams named the dodgers after geraldine rockefeller dodge who owned about one square mile of the town) to morristown, most were still extant until the early to mid 1970's. to be honest in most cases the mansions were in deplorable shape but they were still in place, it was quite a ride for those 3 and a half miles . Chipon1, you are absolutely correct. If my memory serves me well, they began to raze them in 1972 or so. And, you are also correct that it was quite a ride for the three and a half miles. Morristown hasn't been the same since. Am I the only one who noticed that the Evans and Shippen house pictures show the same house? I wonder which is correct? Morristown has always struck me as one of the worst examples of suburban sprawl. A seemingly endless tangle of expanded roads, office parks, institutions, commercial enterprises, corporate headquarters, residential developments and a few farms and estates scattered about with no rhyme or reason to sensible planning or zoning. Very unfortunate. Colles was a close friend of an absurd number of well-known figures in American history -- Albert Gallatin, Andrew Jackson, Henry Clay, Daniel Webster, and many others. He was also close to John Jacob Astor, his partner in building the Astor Place Opera House. He made enough money to retire at a relatively young age, and lived into his mid-nineties. 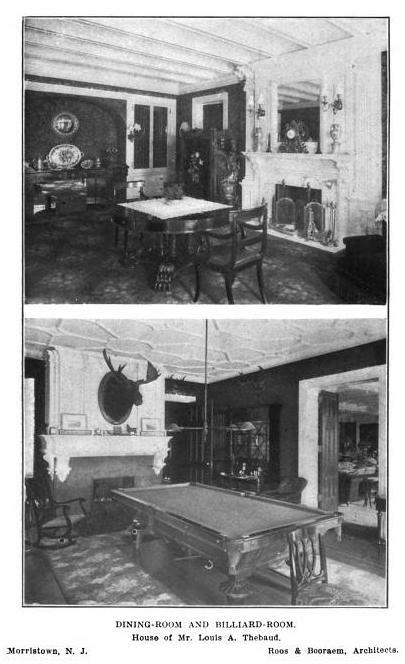 His principal residence was in Manhattan, at 11th and University Place. 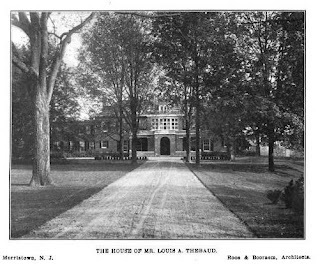 Louis A. Thebaud was not actually in the family import-export business, Thebaud Bros. That part of the family was headed by his step brother Paul G. Thebaud (you earlier posted his house Hilaire on this site). Louis Thebaud, despite coming from a prominent family, was actually not so wealthy until he married Gertrude McCurdy. The McCurdy money was mainly from very large insurance interests. The McCurdy house was nearby. LAT was best known for owning the Gertrude L. Thebaud and for popularizing a Brittany Spaniels in America. 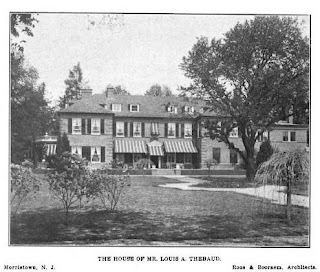 I am pretty sure that Louis A. Thebaud's much-younger second wife, a very nice French woman, still lived here until her death in the mid 1970s.